My new work schedule involves three consecutive 24 hour shifts living with and assisting a wonderful local couple, which is fun but I don’t get much exercise. So when I get done on Tuesday I like to get out and hike a mountain or spend an afternoon riding my bike – anything to get my heart beating and my adrenaline pumping. This week, as soon as I had a free moment I was out on Greenwood Lake repairing my grandparents dock, swimming, kayaking, and practicing self-rescue techniques in my new kayak. It was a blast, though not enough to really get my heart pumping. Around 10:00 tonight I was sitting in my house watching some silly show on Netflix (House, MD) and eating yummy home-made ice cream. To be precise it was home-made Vanilla ice cream with dark chocolate chunks, candied Ginger pieces and a caramel swirl. Made with local raw milk and sweetened with VT Maple Syrup, I tell myu self it’s fairly healthy and I can eat it in large quantities! While generally feeling content I was starting to feel a bit like a lump so I decided a walk was in order. Before I reached the end of my driveway I realized I needed more than a walk, and since I don’t run unless I’m being chased, I headed for my bike shed. I strapped every blinking light I own on my bike, put on my bright reflective safety vest and, feeling adequately dorky and safe, rapidly descended Random Road on my Surly Ogre Mountain Bike. I had no destination in mind but headed down towards Robinson Cemetery, figuring I’d go around “The Loop.” But when I got to my usual turn to loop back and head home I hadn’t gotten enough of the starry night, foggy roads, and glowing yellow eyes following my every move. I continued along past the Old West Church, through Adamant, all the way to East Montpelier before looping back by the East Montpelier Fire Station to the paved County Road and heading home. The approximately 15 mile loop took just shy of two hours. Now I’ve probably spent more nights sleeping out in the woods then most people I know and typically am not one to be wary of Vermont nights, however I haven’t done all that much night biking and I must say having multiple sets of glowing eyes watching my every pedal stroke was a tad creepy. It seemed everywhere I looked there were bright yellow shiny eyes. It reminded me of a tee-shirt I had as a kid that was a picture of a raccoon crossing a dirt road and the caption said “Night Life in Maple Corner.” While most people in town tend to be in for the night by 10 (even the local bar closes by 930 or 10 most nights), the Maple Corner Wildlife seem to just be waking up. My bright LED headlamp is great but still only provides about a 10-15 foot arc of light (depending on speed) in front of my bike and everything else was pitch black. Much of the ride I couldn’t even tell exactly where I was because I couldn’t see anything but the road ahead, most often lined with glowing eyes. Often I could see four or five sets at the same time – all peering through the tall grass and bushes, all following my slow and steady progress up the center of the road. As I crawled passed each I felt as if I was walking a gauntlet – beady eyes just waiting for me to make a misstep. I found myself attempting to guess their species by their approximate height off the ground – it didn’t help that the neighborhood newsletter has been chock full of bear sightings recently! 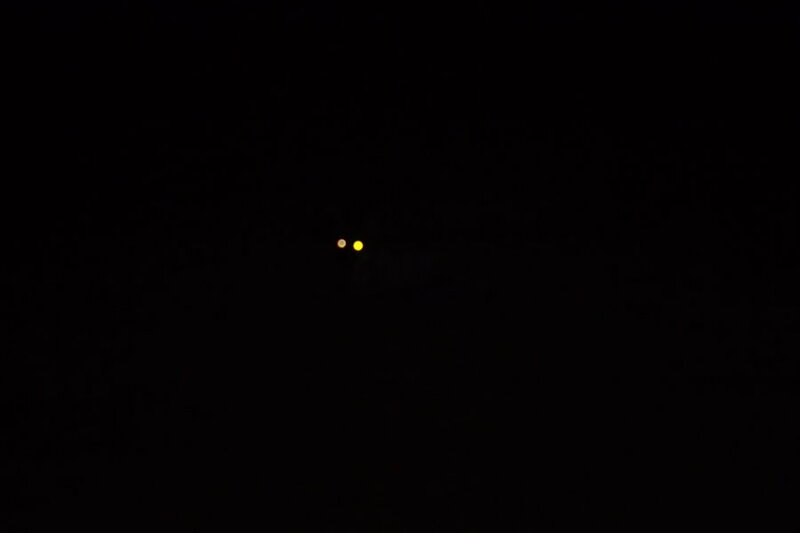 Of the identifiable eyes I saw I counted 4 deer, 3 cats, a raccoon, a skunk (I could only see the eyes but I could smell the tail), a fox, two cars (they look like eyes! ), and too many others to count, most of whom I couldn’t positively identify. Telling deer from dog from cat was easy – but fox versus raccoon versus skunk was a bit harder. I had a mild panic attack as I rode out of Adamant and saw a set of eyes staring out of the bushes no more than a few feet from my bike at the same moment a strong skunk odor permeated my brain – I thought for sure it would be time for a tomato juice bath when I got home. Luckily I was not the target and the odor dissipated shortly after the eyes faded from view. On the home stretch I’d passed out of the forested back roads and cruised along the paved County Road. Looking out over the freshly cut hay fields dotted with prying deer eyes, it was hard to tell where the fire-flies sparkle ended and the stars twinkle began. All in all it was a beautiful evening filled with wonder (and eyes). In the end I certainly achieved my goal of elevating my heart rate, if only for a few hours in the middle of the night. I think I’ll be out for another night ride soon – it’s much cooler than a simple day ride! Great story about the glowing eyes. I really felt like I was riding through the dark with you. As a kid, growing up in rural NH we had to walk up a long hill to get home. 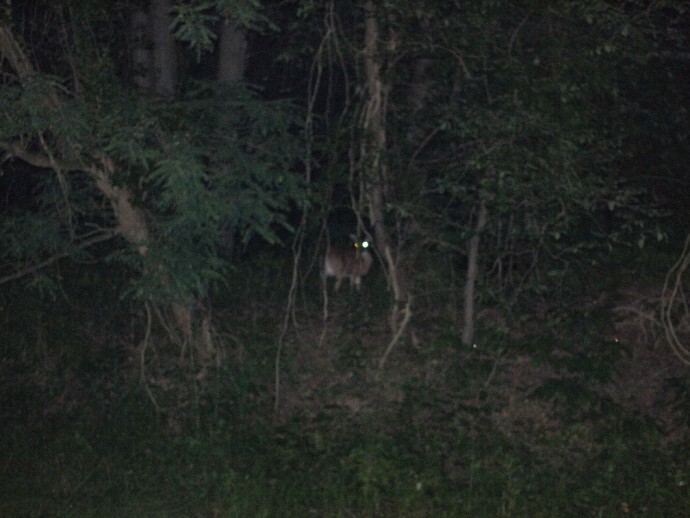 At night we would see all of those glowing eyes and I remember feeling like they would jump out at me at any moment. They never did. But they filled my imagination with stories.